Featuring two easy-to-coordinate ottomans and two chairs with convenient adjustable backs, the Belle Isle Sling Reclining Chair Set brings relaxed luxury outdoors. Thanks to their casually refined aesthetic, these multi-position chairs will also complement any outdoor dining setup. Durable aluminum frames and water-resistant sling coverings allow the chairs and ottomans to endure in salt water climates and poolside settings. Additionally, the chairs feature durable, non-porous Marine Grade Polymer arm rests that will resist the elements for years to come. 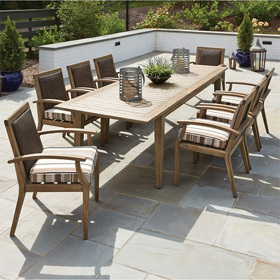 Crafted with care in Upstate New York, the outdoor furniture in this set retains all the hallmarks of Telescope Casual's low-maintenance, high-style designs. Lifestyle Image: Sling fabric shown in Pria (956) with Kona and Textured Kona frame finishes. Reclining Chair 28.5"W x 30"D x 39"H 28 lbs. Ottoman 28"W x 19"D x 16"H 12 lbs.